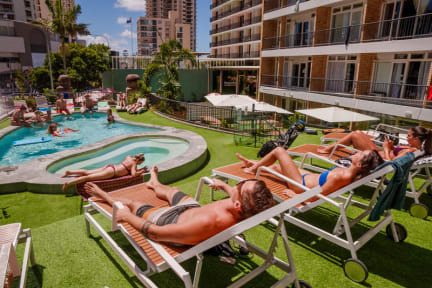 BUNK Surfers Paradise i Surfers Paradise, Australien : Boka nu! Great hostel! Overall clean, big kitchen, safety lockers and toilet/shower in dorm. Good location and I met lots of people. Very modern, clean and nice hostel with great rooms, kitchen and pool. Nice hangout areas and perfect location just a couple of minutes walk to beach, and right in the centre among the main shopping streets. The hostel had its own bar which was very nice, met a lot of people from the hostel there and other guests as well. Just one general tip not related to the hostel: don’t do the arranged pub crawls they’re no good. Amazing hostel with nice location and good vibes. The “bunks” in the rooms are perfect if you want to be alone and just chill. The pool area is perfect to get to know other travellers. Rooms and bathrooms are clean and the kitchen has good facilities. Everything is new renovated. Would recommend this hostel to everyone! Really clean and nice hostel, the staff clean the kitchen multiple times during the day. Good location. One of the best hostel I stayed at along east coast! There is a bar attached to the hostel which give you a free drink every evening! Nice clean place located in the center of surfers! The location was perfect! Close to the beach, shops and grocery store. 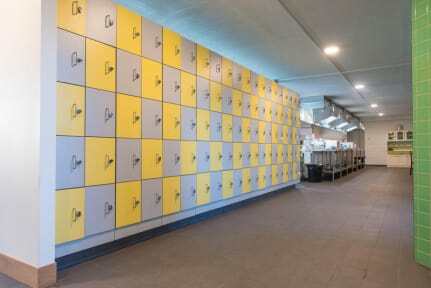 The dorms was very nice and clean with AC and the lockers had safety boxes. The kitchen and pool was great. Definitely worth the money! Super bra läge mitt i stan. Vi blev uppgraderade till ett privatrum så vi levde i lyx. Dock inte så skön atmosfär. Folk var självklart trevliga men alla höll sig för sig själva. Superbra hostel med perfekt läge! Ett väldigt socialt hostel men du kan även skärma av dig med hjälp av din bunksäng om du skulle vilja det. Rekommenderar verkligen detta hostel! Good clean hostel with nice atmosphere.